I know, I know. I already posted an Easter picture, but when I got these photos edited, I just couldn't resist sharing them with you. 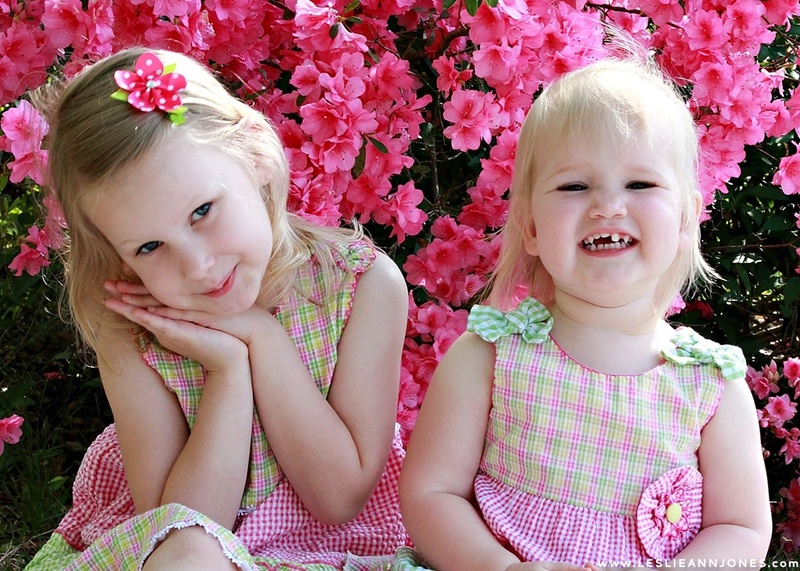 I grew up taking family pictures in front of my Mamaw's massive azaleas, so when they started blooming around here, I knew they would be the perfect backdrop for a quick photoshoot with the girls. Micah was happy because the flowers happened to be pink. Kendall was happy to be outside. And I was happy that they were both looking in the general direction of the camera at the same time. That doesn't always happen, you know. I love the quilt they're sitting on. I ordered it from Karmen's Quilts for Kendall's first birthday. She was great to work with, her prices are reasonable, and the quilt is gorgeous. If you're in the market for a handmade quilt, I can't recommend her highly enough. I snapped away happily for about 10 minutes, and then my camera did the strangest thing. In between one photo and the next, everything turned pink. So strange. Adjusting the settings didn't help, and I couldn't figure out what happened. Eventually, I gave up and came inside. The next day, the camera worked just fine again. These things only happen to me. According to Google, it might be the image sensor (yikes), but I haven't heard back from Canon yet. We shall see. Hope you're all doing well! Things may be kind of quiet around here for the next few weeks. Minted's annual holiday challenge is in full swing, and I'm busy trying to get some designs ready for submission, but I'll be popping in from time to time to check in with you. I've said it before, and I'll say it again: parenting is not for the faint of heart. It's hard, often thankless work, but it's also rewarding and so, so sweet. Outside of the marriage relationship (which deserves a post of its own) there are few things in life that have taught me more about the relationship between God and humanity than parenting. Here are just a few things I've learned over the past four and a half years. 1. Unconditional love cannot be earned or unearned. "I will always love you. Always. No matter what. You will always be my baby, and I will always be your mommy." This is a conversation I have with Micah quite frequently. Usually after she's gotten herself in trouble. I remind her over and over again that even when I don't like her behavior I love her because she's my daughter. I couldn't unlove her if I tried. It is much the same way with God. He loves us. He really, really loves us. Not because we've somehow earned His favor or worked our way into His good graces, but simply because He is our Father. The Bible says that He loved us when we were at our most unlovable (Romans 5:6-8), which comes as a great deal of comfort to someone like me. He doesn't wait for us to get our acts together before extending His love to us. Quite the contrary. He loves us when we are vile, wretched sinners who have hit rock bottom. He loves us when we are as unlovely as you can imagine, which boils down to this: God's love can be neither earned nor unearned. It is a freely given gift of grace. Here's the deal. I'm a sinner. I mess up. I do things I shouldn't do. Those things displease God greatly, and there are consequences for them, but it doesn't mean He has stopped loving me. Just as nothing my girls do can stop me from loving them, nothing I do can make God unlove me. What a relief that is. We'll get on to why in number two. 2. Disobedience is almost always personal. The other day, Micah sneaked a piece of gum after I had forbidden it. She willfully disobeyed me, choosing to place her personal desire for gum over my clear instructions to the contrary. When I discovered her disobedience, I was heartbroken. I know, I know. It's just a piece of gum. But I took it personally because her actions showed that she lacked respect for my authority as her mother and cared more about satisfying her temporary craving than pleasing me. After I calmed down, I thought about how many times in the past 31 years I've disappointed the Lord by willfully disobeying His clear instructions. I've put my own desires over His commands on countless occasions, showing that I care more about my personal (and fleeting) satisfaction than living a life that honors and pleases Him. I wonder how often I have been a source of grief for the Lord. I would like to think that the grief has been minimal, but the truth is I've disappointed Him on countless occasions. That's why I'm so thankful that the unconditional love of the Lord cannot be earned or unearned. That leads us to number three. 3. Tough love is sometimes necessary. Disobedience demands discipline, and I can guarantee you that it's not fun for anyone involved. As much as it broke my heart to do so, I couldn't let the gum incident go by without addressing the disobedience. After discussing what happened, Micah chose her punishment, and I doled it out. Neither of us enjoyed it, but I did it because I'm more interested in shaping her character than making her happy. Sometimes that means that the love I show her is tough indeed. God loves us too much to leave us the way we are. It is true that we can't unearn His love, but it is equally true that He disciplines disobedience because of that love. He won't overlook our sin just because He loves us. He will do whatever it takes to shake our hands loose from the world so that we'll cling to Him instead. Seriously. It only takes a cursory reading of the Old Testament to discover that God sent the people of Israel into exile as a last-ditch effort to get their attention when they had wandered away from Him. If that's not tough love, I don't know what is. I knew we were having supper in about 10 minutes. That's why I told Micah she couldn't have the gum. Besides, she doesn't like spearmint. Every single time she tries it, she spits it out in disgust, but that's beside the point. The point is that not knowing the plan doesn't mean that there isn't one. A lot of disobedience boils down to a lack of trust. If Micah had only trusted me to know what was best, she wouldn't have gotten into trouble. The same thing is true for us. So many times, we make a mess of things because we didn't just wait and see what God had planned. Abraham is the perfect example. He spent 25 years waiting on God to fulfill longstanding promises. Along the way, he lost focus and took matters into his own hands, which, as you can imagine, didn't turn out so well. In the end, the promises are fulfilled on God's timetable, and not a moment sooner. The "not right now" of God doesn't necessarily mean "never." We would do well to remember that the Lord knows what He's doing even when we don't. That's what makes the last point oh-so-sweet. 5. Sacrifice comes with the territory. As hard as this parenting business is, and as frustrating as it can be, this one thing I know for certain: I love my children so much that I would die for them without a moment's hesitation. I wouldn't have to stop to think about it. There would be no weighing of the pros and cons. I would just do it, because that's what love does. It sacrifices itself for the good of others. Any parent knows well the sacrifices that come with the job. From giving up countless nights of sleep to leaving behind dream jobs to making sure that all of their little needs are met before you even begin to consider your own, you know what it means to lay aside your own needs/wants/desires to make sure their needs/wants/desires are taken care of. Think about all the things you would do to protect your children from harm. Now multiply that by 10 million. Those are the kinds of lengths God went to when He died for us. He knew that we would never be able to reach Him on our own, so He did the only thing a loving Father could do. He came to us. He made a way for us to reach Him. He sacrificed Himself for us. Without hesitation. Simply because He loves us. I didn't really understand that kind of love before I had kids. Intellectually, I grasped the concept, but I didn't really get it until I became a mama and realized that I would gladly throw myself in front of an oncoming train just to shove my baby off the tracks. That's exactly what happened on the cross. We were standing in the middle of the tracks completely oblivious to the locomotive bearing down on us when Jesus stepped in front of us to save us. Now that's love. These are just a few things that parenting has helped me understand about God and His love. There is really SO much about His character that I understand more clearly now that I'm a mom. Surely I'm not the only one. What about you? What have you learned about God since becoming a parent? Speak up and join the conversation in the comments! Happy Valentine's Day from my little loves. These two have taught me much and more about what it means to love and be loved. Special thanks to my big sister for the cute Valentine shirts. My girly girls love them! Hope your day is filled with lots of love and laughter.